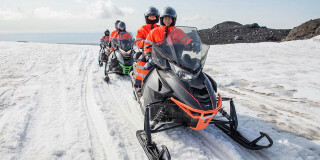 The start times are 10:30 a.m., 12:30 p.m., 1:00 p.m., and 2:30 p.m.
6 km (3.7 mi) after Skogar you turn left (just after the bridge) onto road 221 and then follow road 221 for about 5 km (3 mi) to the Solheimajokull Cafe parking area. (Expected 20 - 30 min for this part). 3 km (1.9 mi) after you pass road 222, you turn right (just before the bridge) onto road 221 (gravel road) and then follow road 221 for about 5 km to the Solheimajokull Café parking area. (Expected 20 - 30 min. for this part). 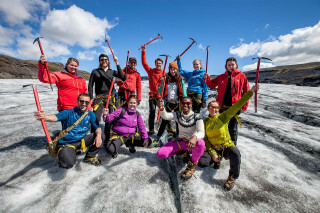 Falling along the slopes from the Myrdalsjokull ice cap is the Solheimajokull glacier tongue. This ridged ice of the 10 x 2 km wide (6 x 1 mi) expanse creates a stunning frozen landscape. 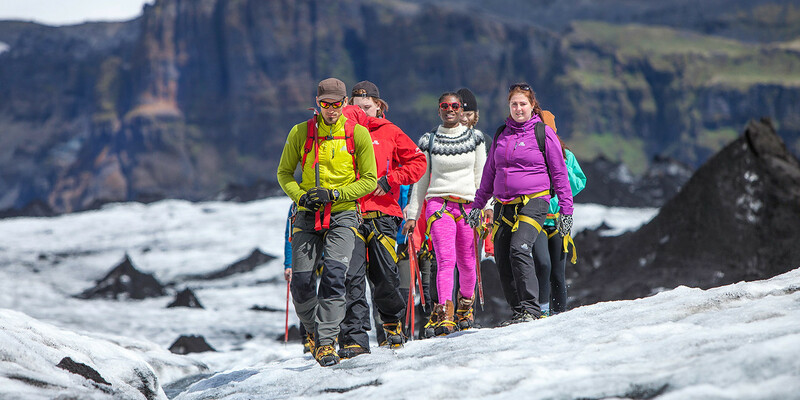 With the right equipment and guidance, walkers of all levels can explore a glacier and create an unforgettable memory in Iceland. 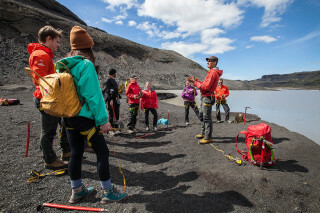 Meeting in the Solheimajokull parking lot, your certified glacier guide gets you suited up in all the necessary gear. Once you clamp your crampons on your boots and hold your ice axe, the guide leads a safety briefing before leading you to the main attraction. Step your spiky soles into a frozen wonderland of glacier ice. The spectacular colors of the ice range from white, blue or crystal clear in a variety of shapes. 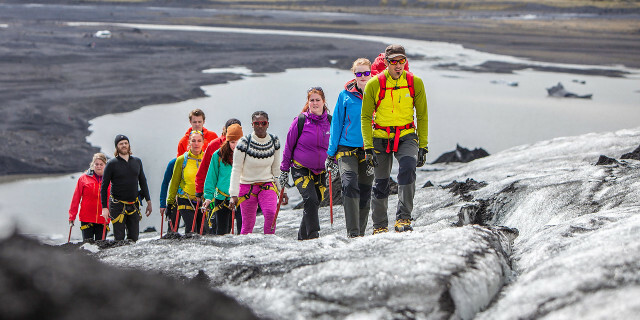 You safely pass by deep crevasses, water cauldrons, and more as your guide explains their formations. 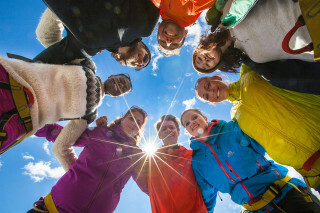 During the hike, you have plenty of photo opportunities thanks to the great viewpoints. The glacier falls from 1,300 meters (4265 ft) down to 100 meters (328 ft), offering stunning panoramas. 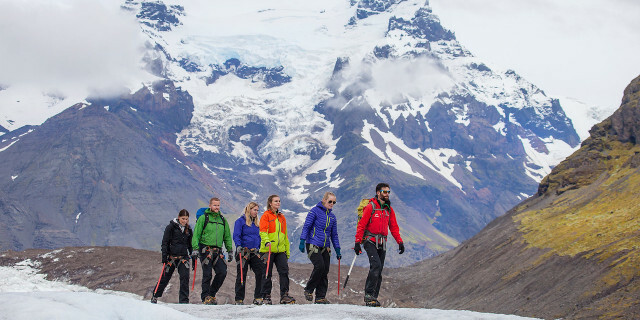 Additionally, your expert guide shares his wisdom about the ever-changing landscapes of the Icelandic glaciers, their formation, and how these icy giants are connected with the surrounding volcanoes and mountains. 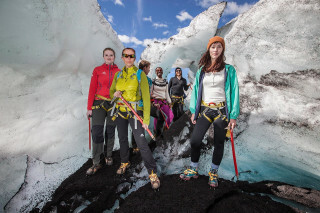 No technical skills are needed for this tour and you will be provided with all the necessary glacier walk equipment. 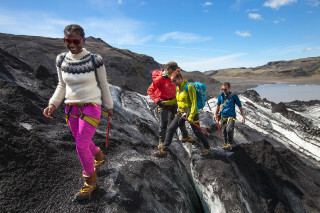 This is a great, family-friendly way to experience an Icelandic glacier. 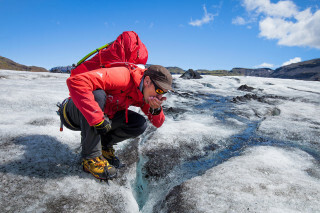 Among many other natural wonders, glaciers are a must-see when visiting Iceland. 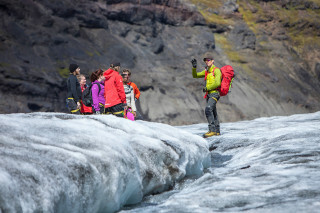 The undeniably fascinating journey of glacier walking up the Solheimajokull glacier will be frozen in your mind forever.